Summer has arrived and what could be more pleasing than the aroma of fresh herbs on the outdoor grill. From our cave dwelling ancestors to the modern day back yard chef, rosemary has been used over an open fire. So simple to use and yet such a difference it makes. Try a sprig under your next steak or hamburger, or slip a sprig down inside the husk of your roasting corn. Rosemary butter makes a great baste, or add a few sprigs to your marinade for meat. 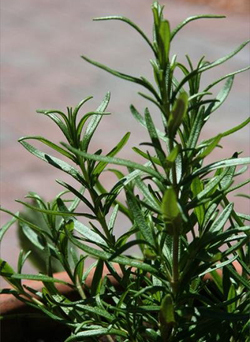 Rosemary takes its name from Latin words meaning “Dew of the Sea.” On the coasts of the Mediterranean, where rosemary grows wild, its grey bloomed leaves make the hillsides look as if they are covered with dew. Known as the herb of remembrance, Greek scholars wore it on their heads to help them retain information. And speaking of heads, a decoction of fresh rosemary used as a rinse will condition the hair and stimulate growth. The next time you cook outdoors, don’t forget that a few sprigs of rosemary laid among the charcoal will take the place of using mesquite charcoal.